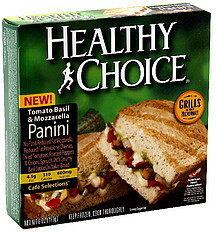 Italian Bread: Enriched Unbleached Flour (Wheat Flour, Malted Barley Flour, Niacin, Reduced Iron, Thiamine Mononitrate, Riboflavin, Folic Acid), Water, Whole Wheat Flour, Wheat Gluten, Contains 2% or Less of the Following: Sugar, Flavoring (Cultured Wheat and Yeast), Soybean Oil, Yeast, Salt, Italian Herb Seasoning (Spices, Dehydrated Parsley, Salt), Flavoring (Wheat Flour, Modified Food Starch, Natural Flavors), Enzymes. Cheese Blend (No Fat Mozzarella Cheese: Pasteurized Skim Milk, Cheese Cultures, Salt, Enzymes Natural and Artificial Flavor, Artificial Color, Vitamin A Palmitate. Low Moisture Reduced Fat Mozzarella Cheese: Pasteurized Part-Skim Milk, Cultures, Salt, Enzymes, Smoke Flavoring. Low Fat Provolone Cheese: Pasteurized Part-Skim Milk, Cultures, Salt, Enzymes, Smoke Flavoring). Diced Tomatoes with Calcium Chloride, Fire Roasted Onions, Fire Roasted Red and Yellow Peppers, Chopped Spinach, Contains 2% or Less of: Basil Blend (Basil, Garlic, High Maltose Corn Syrup Solids, Olive Oil Salt), Grated Parmesan Cheese: Part-Skim Cow's Milk, Cheese Cultures, Salt, Enzymes, Vinegar, Modified Food Starch, Maltodextrin, Soybean Oil, Salt, Parmesan Cheese Powder: Parmesan Cheese (Cultured Part-Skim Milk, Salt, Enzymes), Disodium Phosphate, Salt. Romano Cheese Powder Made from Cow's Milk: Romano Cheese (Cultured Pasteurized Part-Skim Milk, Salt, Enzymes), Disodium Phosphate, Salt. Whey Protein Concentrate, Caramel Color, Sugar, Granulated Onion, Granulated Garlic, Red Pepper, Mayonnaise Flavor (Glycerin, Propylene Glycol, Natural Flavor), Whole Basil, Parsley, Xanthan Gum.